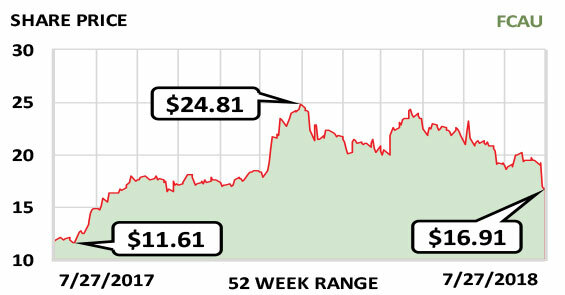 This week’s Stock of the Week is an automaker that has had an impressive turnaround and is only getting stronger. Fiat Chrysler Automobiles N.V. (FCAU) is the world’s seventh-largest car manufacturer and the parent of such strong and well-known brands as Jeep, Dodge, Ram, Maserati and Alfa Romeo. CEO Sergio Marchionne’s plan to retire after a highly successful turnaround of the company was cut short when he passed away in July. The new CEO, Mike Manley, is credited with having led the Jeep brand’s enormous growth. The right people appear to be in place to manage Fiat Chrysler and continue Marchionne’s drive to focus on core strengths and not try to be all things to all people. This ranges from phasing out sedans in favor of higher-margin SUVs and trucks to using cash flow to improve the balance sheet by paying down debt. The world economy is in the late part of a positive economic cycle, and a downturn would be challenging for all car companies. But Fiat Chrysler management has taken steps to handle the big changes in the automotive industry—such as the growing push for electric vehicles—while preserving the company’s improving debt-to-capital ratio. Revenue was $111 billion last year and is likely to be $120 billion this year and $125 billion in 2019. Fiscal year: December. Earnings per share: 2019 est./$4…2018 est./$3…2017/$2.24.